If you are looking for an idyllic setting for your special day, the look no further. The North East River Yacht Club is the perfect waterfront venue for your wedding ceremony and reception. 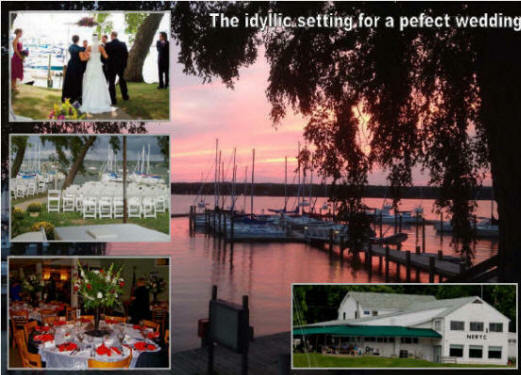 A backdrop of tranquil gardens, sailing boats and stunning Chesapeake Bay vistas will provide a unique nautical charm to your outdoor ceremony and wedding portraits. You may also add special touch to your day by utilizing our modern marina for the bridal party to arrive or depart by boat. No matter your budget or your style, our friendly and experienced staff will work with you to provide a fully inclusive service or customize a package to meet your requirements. The Commodores Ballroom offers a panoramic view of the Bay and can comfortably accommodate up to 160 guests, and the Upper Room, which is located on the mezzanine floor overlooking the Commodores Room, can be used separately or incorporated to include a buffet, bar and/or dance floor. Consider keeping everything in-house and let NERYC host your bridal shower or rehearsal dinners too. Conveniently located less than an hour from major transportation hubs in Baltimore, Philadelphia and Wilmington, with a variety of local accommodation options to choose from. For more information on wedding packages, or to arrange a consultation and tour, contact our Wedding Coordinator.